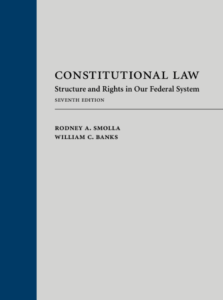 “Twenty-five years ago we set out to create a constitutional law casebook that teaches well,” write Professor Emeritus William C. Banks and Dean Rodney Smolla of Widener University Delaware Law School in the Preface to the seventh edition of Constitutional Law: Structure and Rights in Our Federal System (Carolina Academic Press, 2019). “We wanted to teach from a book that would engage students in learning basic constitutional law and would enable teachers to work with cases and problems relatively unencumbered by extensive secondary source materials and treatise-like notes. Traditional in scope, with full coverage of separation of powers, federalism, and individual rights, Constitutional Law emphasizes structural issues more so than many other constitutional law casebooks. Individual rights are discussed in context and within chapters focusing on traditional doctrinal categories, such as economic and social rights, rights of conscience and expression, and rights in the public arena. The seventh edition makes heavy use of contemporary constitutional conflicts to present in a vivid manner the cases and secondary material traditionally covered in comprehensive constitutional law courses, including case studies in issues such as gun control, problems on the special counsel investigation by Robert Mueller, the Supreme Court’s resolution of which branch controls recognition of Jerusalem in providing passports, and controversies surrounding the Affordable Care Act. This edition also expands dramatically the coverage of the religion and speech clauses, so that the casebook is useable for comprehensive courses on the First Amendment at law schools that break out coverage of constitutional law into a basic course and a follow-up course on civil liberties or the First Amendment. The Origins: “We the People”: Where Does Power Reside in Our Constitutional System? (WAER | April 19, 2019) WAER’s Chris Bolt spoke with Professor Emeritus William Banks on some of the legal and historical aspects of the report and what it means going forward. One of most significant things about the report William Banks says, might be what’s not there. President Trump was never directly interviewed about any of the allegations. Intent would have to be established for prosecutors to be able to bring any charges for obstruction of justice against the president. But that doesn’t mean the investigation didn’t have legal ramifications … he notes two dozen indictments of others came out of it. Still, no direct questioning of President Trump leaves a hole in any possible criminal case. He found in the report less redaction that he thought by Attorney General William Barr. Most things blacked out had to do with grand jury materials, things relevant to ongoing congressional investigations, and identification of ancillary witnesses. What does concern him, is the lack of objectivity from the Attorney General’s office. Of course you can’t escape the political aspects of the investigation and the report. Senator Kirsten Gillibrand, who’s a presidential candidate, called it an embarrassing display of propaganda. She said in a release that the nation can’t trust a hand-picked attorney general and that congress should see the full, un-redacted report to really find the truth. Area Congress members John Katko and Anthony Brindisi had different reactions to the release of the report, both speaking at a public event in Oswego. Katko told Syracuse.com he had no problem with Barr’s press conference and then releasing the report. He’s more concerned with what’s in it and how we reduce Russian influence in elections. Brindisi wants to see a full, un-redacted version before drawing conclusions, though he also does not want the investigation to overshadow other issues that need attention. Professor Banks meanwhile believes the prospect of Congress starting impeachment proceedings is not in the cards. While the President might not face that challenge, Banks says the whole process draws into question just how Mr. Trump views the office. And he adds things are far from over. There are still ongoing grand jury investigations; congress will have its own investigations and hearings; and Banks expects you should get used to hearing about the report and all manner of reactions to it on the campaign trail. The Institute for National Security and Counterterrorism (INSCT)—a collaboration between the Syracuse University College of Law and the Maxwell School of Citizenship and Public Affairs—has added five senior national security experts to its academic and advisory leadership team. These Distinguished Fellows—drawn from the upper echelons of the national security and intelligence communities—will assist the Institute’s mission with a variety of assignments that will directly benefit students and expand INSCT’s portfolio of research and policy projects. Joining INSCT are Steve Bunnell, Co-Chair of Data Security and Privacy at O’Melveny & Myers LLP, former General Counsel of the US Department of Homeland Security, and former Chief of the Criminal Division at the US Attorney’s Office in Washington, DC; Rajesh De, Chair of the Cybersecurity and Data Privacy practice and Co-Chair of the National Security practice at Mayer Brown LLP and former General Counsel for the US National Security Agency; Avril Haines, Senior Research Scholar at Columbia University, former Deputy National Security Advisor, and former Deputy Director of the Central Intelligence Agency; Amy Jeffress, Partner at Arnold & Porter Kaye Scholer LLP and former Counselor to the US Attorney General; and Lala Qadir, Associate and Member of the Artificial Intelligence Initiative at Covington & Burling LLP and Lecturer in Law at George Washington University Law School. Among the Fellows’ roles—in Syracuse, New York City, and Washington, DC—they will help teach national security courses; lecture in the Institute’s speakers program; provide students with career advice and guidance; and offer insights and input regarding the Institute’s classroom and practical curriculum and its research and policy portfolio. They also will help the Institute stand up and teach a cutting-edge course on the practice of private national security law. “Specifically, the Distinguished Fellows give the Institute the opportunity to fill a need that is not being met,” continues Judge Baker. “They will help us teach students at the College of Law and the Maxwell School what they need to know in order to practice in the area of private national security law and policy—at law firms, as in-house counsel, or as business officers and executives. This is an area of private practice that is growing exponentially, that offers career opportunity for our students, and that is critical to US national security, as well as the protection and advancement of US legal values.” It is anticipated that additional Fellows will join those announced today. (KPCC (Los Angeles) | April 18, 2019) Two years and countless subpoenas and indictments later, the Department of Justice has released a redacted version of the Mueller report to the public. In a press conference, Attorney General William Barr on Thursday laid out in advance what he said was the “bottom line:” No collusion between the Trump campaign and Russian government hackers. Barr said at a news conference that the president did not exert executive privilege to withhold anything in the 400 page-plus report. And he said the president’s personal attorney had requested and gotten a chance to review the report before its public release. Barr said that no one outside the Justice Department has seen the unredacted Mueller report. And he added that no redactions were either made or proposed outside of the small group of Justice staffers that pored over Mueller’s report. (Re-published from U.S. News & World Report | April 4, 2019) This first week of April marks the 25th anniversary of the Rwandan genocide, a three-month long massacre during which Hutu militants killed an estimated 800,000 Tutsis and moderate Hutus after the Hutu president was killed. The international community responded to the atrocities late, and then sought accountability after the genocide by establishing the International Criminal Tribunal of Rwanda (ICTR) to try those most responsible. The law, and particularly international criminal trials, should teach us about past mistakes. It is important that we remember the horror of the genocide and reflect on the mistakes made, in order to work toward a more peaceful future. One of the main takeaways from the ICTR’s atrocity trials is that words matter. The world of the Rwandan genocide may to most people seem far removed from the United States. It does not to me. I am a law professor who grew up an Army brat, often abroad. I graduated high school in Nuremberg in the former West Germany – the site of the famous Nuremberg Tribunal held in the wake of the Holocaust. I know that words matter. Always mindful of the horrors of the Holocaust and the ways that democratic majorities can scapegoat and dehumanize minorities, my professional focus has been in constitutional and international law. Syracuse University Professor Cora True-Frost is an INSCT Affiliated Faculty Member. Syracuse University College of Law students working for the Syrian Accountability Project have released an exploratory account of the violence that has occurred along the border of the Gaza Strip and Israel starting in March 2018. 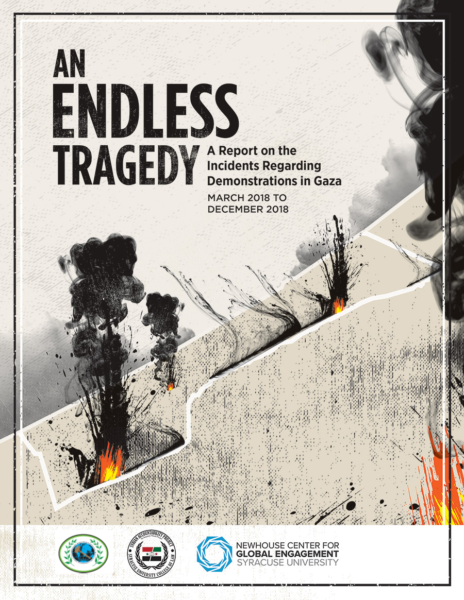 “An Endless Tragedy: A Report on the Incidents Regarding Demonstrations in Gaza” examines acts of violence perpetrated by both sides of a conflict that has become known by Palestinians as “The Great March of Return”. The report—supervised by Distinguished Scholar in Residence David M. Crane L’80—has been sent to the United Nations, which continues its own analysis of the conflict through the UN Human Rights Council Independent International Commission of Inquiry, of which Crane is a former member. Authored by third-year law students Margaret Mabie and Brandon Golfman, the report covers actions that took place through December 2018. On March 30, 2018, violence erupted along the Gaza/Israel border fence as Palestinians began protesting Israel’s blockade of Gaza and demanding the “right of return” to land lost in the 1948 Arab-Israeli war. According to the Office of the UN High Commissioner for Human Rights, the ongoing protests—which have continued into 2019—have claimed the lives of 189 Palestinians (with roughly 19,000 injured) and one Israeli soldier. Israel’s use of deadly force—against what it claims are militants aligned with Hamas—was condemned in June 2018 by UN General Assembly Resolution ES‑10/L.23. This resolution calls on Israel to protect Palestinian civilian protesters, to allow humanitarian assistance into Gaza, and to work toward mediation with the Palestinian government. The report’s structure, explains Mabie, follows that used by SAP in its reports on the Yazidi Genocide, the gas attack on the Syrian province of Idlib, the Siege of Aleppo, and sexual violence in the ongoing Syrian Civil War. The Gaza report begins with a historic overview of the conflict between Israel and Palestine and an examination of “Nabka” (the 1948 Palestinian exodus) and “Nabka Day,” which the 2018 demonstrations were intended to commemorate. After an overview of the 2018 protests, the report then provides a highly detailed, day-by-day analysis of the violence in its Conflict Mapping Narrative, which uses open sources and on-the-ground reporting to pinpoint legally relevant acts perpetrated by all sides of the conflict. The narrative is accompanied by a Crime Base Matrix that isolates acts of violence that may constitute war crimes or crimes against humanity, with specific articles of international humanitarian law cited for each act. On the other hand, the June 2018 UN resolution expresses “deep alarm at the loss of civilian lives and the high number of casualties among Palestinian civilians, particularly in the Gaza Strip, including casualties among children, caused by the Israeli forces”. In February 2018, the UN Independent Commission of Inquiry released its own analysis of the Gaza protests, titled “No Justification for Israel to Shoot Protesters with Live Ammunition“. This year’s Sloan Seminar—“Assessing the Future of Domestic and International Terrorism”—was billed as a “a conference honoring the ground-breaking contributions of Dr. Stephen Sloan to the field of counterterrorism, [bringing] together experts in counterterrorism analysis, policy, and national security law.” It was co-sponsored by the Murrah Center and the Center for Intelligence and National Security at the University of Oklahoma. Joining Judge Baker at the seminar were Michael J. Boettcher, Senior Fellow at the University of Oklahoma Center for Intelligence and National Security; David N. Edger, Managing Director and Founder of 3CI Consulting LLC and former CIA officer in the clandestine service; Robert A. Kandra, Senior Advisor with the Chertoff Group, Advisor to the XK Group, and former CIA officer in the clandestine service; Homer S. Pointer, Senior Fellow of the Murrah Center for Homeland Security Law and Policy, Oklahoma City University School of Law; Magnus Ranstorp, Research Director at the Centre for Asymmetric Threat Studies, Swedish National Defense University; James L. Regens, Regents Professor and Founding Director of the University of Oklahoma Center for Intelligence and National Security; and Stephen Sloan, Noble Foundation Presidential Professor Emeritus of Political Science, University of Oklahoma. Corri Zoli, Director of Research at the Institute for National Security and Counterterrorism, presented two papers and was a panel discussant at the 2019 International Studies Association Annual Convention in Toronto, Canada, on March 27 and 28, 2019. At the Wednesday session of “Revisioning International Studies: Innovation and Progress,” Zoli presented on the “Challenges for Contemporary Special Operations Forces” panel. Her paper—”Terrorist Critical Infrastructures, Organizational Capacity and Security Risk”—joined others on topics such as computer-mediated threat assessment, weak states, ethic conflict, and terrorists’ use of emerging technologies. On Thursday, Zoli joined the “Shaping the National Security State” panel and read “Leviathan Revisited: Assessing National Security Institutions for Abuse of Power and Overreach.” Other papers on this panel addressed civil‐military relations, the defense industry, and Cold War Military Balance. Later in the same day, Zoli was the Discussant on the panel “New Directions in Qualitative International Studies” chaired by Eric Stollenwerk of Freie Universität Berlin. This wide-ranging discussion looked at modern qualitative international studies through the lenses of multi-method research, philosophy, autoethnography, and public diplomacy. Rutgers Center for Security, Race, and Rights (CSRR) has announced that William C. Banks has joined CSRR team as a Distinguished Senior Fellow. Banks is a Syracuse University College of Law Board of Advisors Distinguished Professor and Emeritus Professor at the College of Law and a Maxwell School Professor of Public Administration and International Affairs. During 2015-2016, Banks was Interim Dean of the College of Law. He is the Founding Director of the Institute for National Security and Counterterrorism.